Designed for high quality colour output and reliable performance, the HP Colour LaserJet Enterprise M651xh printer is perfect for a growing business looking to improve productivity. It's robust with versatile connectivity features and functions that can simplify document production. 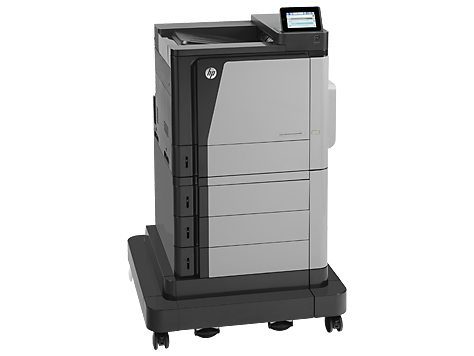 The HP M651xh high-volume colour laser printer can be upgraded easily, too. The base unit is 1000mm tall, 665mm deep, and 660mm wide, and weighs 69.6kg, with default paper trays (including a 500-sheet input cassette, a 100-sheet multi-purpose feeder, and three high-capacity units with a stand). The HP LaserJet Enterprise M651xh colour printer runs on 1.5GB of memory while being powered by an 800MHz processor. On-board operation is through a 4.3-inch resistive touchscreen with a home button. The standard connectivity options are USB 2.0 and Ethernet, with an accessory for Kensington Lock and two USB host ports. The HP LaserJet M651xh printer supports wireless and mobile printing. It's easy to operate, and it maintains productivity with ease through upgradeable firmware. Duplex printing is standard. Administrators can control and centrally monitor connected printers with HP Web Jetadmin, and protect sensitive data with an encrypted hard disk and advanced security solutions. The Colour LaserJet Enterprise M-651xh prints fast in sharp and consistent detail at 1200x1200dpi. Users can save money on original HP Colour LaserJet M651xh printer cartridges by ordering a cheaper pack of all four colours that includes the black, cyan, magenta and yellow toners as opposed to buying single cartridges. The high initial price of the HP M651xh colour laser printer is a drawback for the budget-conscious user. The display screen and the memory could both be bigger. The HP LaserJet Enterprise M651xh is heavy and expensive to upgrade. Wi-Fi is optional.